August 6 is National Root Beer Float Day. This food related holiday celebrates a type of ice cream soda which is sometimes referred to as a “brown cow” or “black cow”. An ice cream soda is a beverage consisting of ice cream and a soft drink or mixture of carbonated water and flavored syrup. It was invented in 1874 and quickly became popular among teenagers. Ice cream soda made with root beer is known as the root beer float. It is typically made with root beer and vanilla ice cream. Root beer floats are a specialty of the chain A&W Restaurants popular in the United States and Canada. 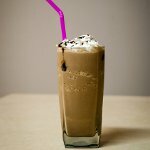 The root beer float is also known as a “black cow” or “brown cow”, but the definitions of these names may vary by region. For instance in some areas float made with chocolate ice cream instead of vanilla is called a “brown cow” or a “chocolate cow”. In some localities, a “black cow” is a root beer float where the ice cream is mixed with root beer, rather than simply placed on top. Adult variations of the root beer float can contain alcoholic root beer or have added liquor such as rum or bourbon. To celebrated National Root Beer Float Day, indulge yourself with this delighted beverage which is a perfect treat for a hot August day.